American evangelicalism is anti-intellectual. Such a view has enjoyed fairly wide currency since Mark Noll’s The Scandal of the Evangelical Mind. In Apostles of Reason, Molly Worthen attempts to correct this view, but not by rejecting it outright. She shows how American evangelicals have been engaged in a range of intellectual projects – institutions, magazines, bible schools, etc. – albeit ones often at odds with the prevailing norms of secular academies. Even anti-intellectualism is an intellectual project, then, and Worthen roots this loose program in what she calls the “evangelical imagination”. Three elemental concerns unite evangelicals: how to repair the fracture between spiritual and rational knowledge, how to assure salvation and a true relationship with God, and how to resolve the tension between the demands of personal belief and the constraints of a secularized public square. To Worthen, from 1940 to 2010 American evangelicals have been pulled in two directions simultaneously: they want to uphold what they regard as the standards of the Bible and of modern reason. In this she notes that they are heirs of German Pietism, English moralism, American revivalism, and European Enlightenment. John Wesley’s Methodism, for instance, was simultaneously a modern religion of the heart and the head, and today’s evangelicals navigate a similar divide. Worthen insists that the disagreements over what the Bible says and how it relates to modern reason has been the driving force behind evangelical engagement in modern culture, and has very frequently exposed its weakness. Yet she suggests that the evangelical imagination has been productive precisely because it has been so fractured. Apostles of Reason tells a story in which American evangelicals forged their cultural identity through repeated confrontation. Carl Henry sought to distance and distinguish American evangelicalism from rivals such as Karl Barth, the National Association of Evangelicals had to overcome Protestant confessional and denominational concerns, evangelical bible institutes and colleges wrestled with the desirability of secular academic accreditation, while voices as different as John Howard Yoder and Francis Schaeffer offered very different blueprints for evangelical engagement in culture and politics. To read Worthen’s books is to learn in detail just how contested modern American evangelicalism has been in its formation, its history, its identity. It is an engaging, informative history, and it deserves to be read by evangelicals and scholars alike. Yet the book prompted a basic question for me while reading: in what way are American evangelicals unique in facing a crisis of authority? Worthen makes it clear that they were navigating many of the same challenges to the inherited relationship between intellectual authority, politics, and cultural change alongside their fellow Protestant and Catholic Christians. In that respect they weren’t unique or alone. What seems specific to the crisis of authority, at least as Worthen puts it, derives from the general tendency of American evangelicals to emphasize a particular intellectual scheme where presuppositions trump evidence, where certain kinds of evidence is regarded as universal fact, where reason is a buttress to faith, and where Scripture aligns perfectly with reality. But consider a different example. The modern historical discipline has undergone a series of repeated inquiries into the sources of its intellectual authority since it began to professionalize in the eighteenth and nineteenth centuries. Although modern professional historians aren’t typically burdened with the dilemma over of the relationship between revelation and “modern reason”, they do face deeply challenging questions about the relationship between their evidence and their arguments, interpretations, and narratives. At one point Worthen writes that most historians “strive to approach the ideal of perfect disinterest”. Yet there have been important and interminable debates amongst historical practitioners and theorists of historical writing with respect to the so-called “objectivity question”. It could be argued that professional historians are no more united with respect to the sources of their intellectual authority than American evangelicals, to say nothing of their views on cultural and political engagement. Worthen does not fault American evangelicals for obeying some given authority, since she argues that obedience based on some set of irreducible assumptions is a demand of all intellectual life. Rather, she faults them for trying to obey multiple authorities at once. I’m not sure how much rides on this particular explanation, or what sort of analytical insight it ultimately offers. After all, professional historians maintain diverse sources of intellectual authority and yet they continue to practice their craft while holding a range of cultural and political commitments – just think of the ongoing debates currently taking place in Britain over their history and its place in formal education. Even if American evangelicals aren’t alone in managing their intellectual quandaries, Worthen has provided an illuminating account of how their tensions – the “struggle to reconcile reason with revelation, heart with head, and private piety with the public square” – have energized their activities and characterize their history. 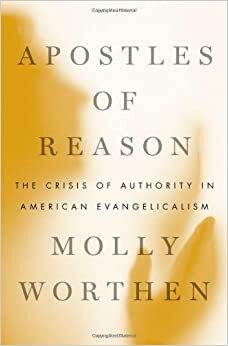 Apostles of Reason: The Crisis of Authority in American Evangelicalism by Molly Worthen. Oxford, 2013, 352pp.